This article focuses on international experiences gained in financing infrastructure through local currency revenue bonds and the applicability of such methods to Africa. Financing the much needed investment in Africa’s infrastructure is one of the crucial challenges facing the continent. The African Development Bank and the World Bank estimate the financing needs to be in excess of $93 billion per year (1). 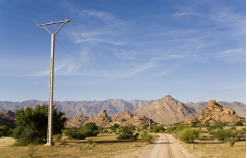 A Program for Infrastructure Development in Africa (PIDA) study on key regional projects estimates investment needs of $68 billion per annum until 2020 for regional projects alone. These numbers are daunting, but the challenge – to build sustainable infrastructure in Africa – has to be met. And one of the ways this can be done is by the continent taking ownership of this challenge, rethinking infrastructure financing, and mobilizing resources already available on the continent – to promote inclusive growth. 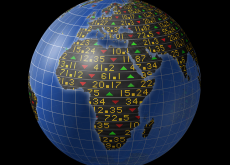 As Africa has been growing, so have its financial resources. African countries have been growing at rates in excess of 5 percent. Indeed seven of the ten fastest growing countries in the last few years are in Africa. This has created a growing middle class and a flourishing financial sector. Savings are accumulating with institutional investors such as pension funds and insurance companies, and the capital markets in several countries are doing very well. The current state of the market is such that it is sure to welcome an opportunity for further innovation in the financial sector. 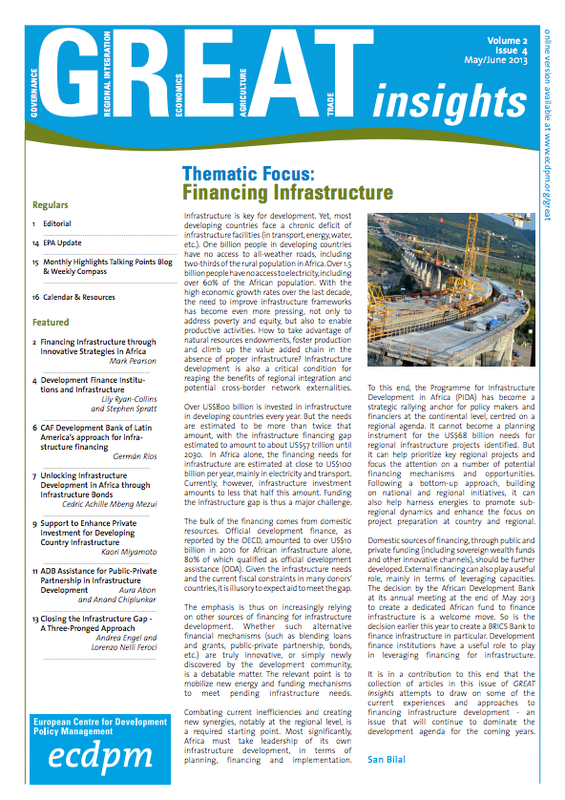 The interest in financing African infrastructure projects with infrastructure bonds has recently increased., prompted in part by certain unique features of the bonds. An infrastructure bond is a debt instrument issued by governments or private companies to raise funds from the capital markets for infrastructure projects. The interest payments associated with infrastructure bonds (and repayment of the principal) are typically funded with a direct linkage to the cash flow revenue generated from the underlying infrastructure project – such as a toll road. Infrastructure bonds can be issued by private companies without a need for government assistance. Bonds such as these can also benefit from credit enhancements such as viability gap funding, or partial guaranteed to make projects more bankable. Credit enhancements can be especially useful where there is a project with strong revenue potential and good management structure but where the issuing entity may have institutional or credit weaknesses. The underlying project itself can therefore be structured to assume its own standalone risk profile which is distinct from that of its sponsors. Thus, infrastructure bonds in their broadest sense can mean any structured debt raised through local or international capital markets secured by or serviced from the cash-flows of a specific project or a portfolio of projects, without recourse to the sponsors. Fully non-recourse project bonds for infrastructure are much less common however. 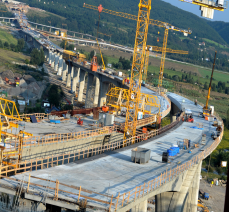 As infrastructure projects involve a capital-intensive construction phase that must be financed, loan structures are more common in infrastructure project finance than bonds as they are more flexible. Loans can be drawn down gradually during construction (avoiding so-called “negative carry”). For syndicated loans, borrowers are generally given a call option for free, whereas bonds are difficult to refinance. Loans are therefore more efficient for smaller financings, since bond issuance involves greater overheads associated with getting a credit rating, documentation and governance. Nonetheless, there are benefits to bonds over loans: (i) it is cheaper to finance with bonds, (ii) bonds are available for incremental funding, (iii) they normally have longer maturity dates and (iv) they are sometimes available in different currencies. If we consider the definition of an infrastructure bond per se, those from African countries such as Kenya, Cameroon, Chad and a large part of the transactions in South Africa are strictly speaking not infrastructure bonds. They are general government bonds with some promise to spend the money in infrastructure investment. They have no income stream associated with the underlying asset, and cash flows for the bonds are paid directly out of government tax revenues. There is also no guarantee that the money raised goes into the project as promised, and neither is there a dedicated Fund Manager, raising concerns about the ability of central government to channel the funds to actual development of infrastructure projects. In such situations, government credibility becomes critical to ensuring investor confidence, particularly in the issuance of future bonds and in creating a viable infrastructure bond market. 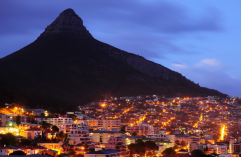 South Africa, with a large and sophisticated investor base totaling $600bn (more than the other countries combined), stands out on the continent in terms of local market liquidity, capital market development and experience with project finance. However, local currency infrastructure bonds have not been considered to date as the government feels that such bonds are too far removed from projects, preferring that parastatals issue bonds and the government provide guarantees for certain projects. 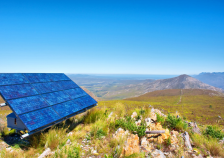 For example, Eskom is an integrated power utility wholly owned by the government and with a track record of issuing bonds locally in Rand as well as internationally in Euro and Dollars. It currently has ZAR 105bn outstanding in the market, with 2033 as the current longest maturity. Similarly, the South African National Roads Agency (SANRAL) has a domestic capital markets program totaling ZAR 44bn. In 2008 it issued four bonds totaling ZAR 2bn to fund new tolled highways in Gauteng as well as other road upgrades. This included inflation-linked floating-rate bonds and three fixed rate bonds with maturities up to 20 years. It was the first time SANRAL issued without a guarantee from the National Treasury. Also, the Airport Company of South Africa (ASCA) rolled out a ZAR 1bn three month commercial paper program in 2008-09, which it subsequently refinanced using long-term bonds. Beyond Africa, other emerging countries such as Chile, Brazil and Malaysia are using project finance bonds as a way to catalyze investor interest in infrastructure project. Such examples can serve as a template for African countries on how to develop their own markets. But it is important to understand all the different policy measures and government actions that went towards the creation of the market for these project bonds. In particular government policy has been supportive in pension regulation to build the investor base and in building an enabling environment for infrastructure which allowed financeable projects to be structured. These are important case studies and templates for informing the future actions of African governments and how their policies can shape the market in the future. Infrastructure: Infrastructure needs to become a policy priority; regulation and tariff reform need to be implemented; Independent Power Producers (IPPs) need to be encouraged; enabling law for concession/PPP need to be enacted. Africa has the potential to meet a significant part of its infrastructure investment needs from domestic sources. Specifically, some African capital markets across the continent already have the capacity to provide part of the financing that is needed to help tackle the infrastructure needs across the continent. One area where more progress is required in all markets is in providing an enabling environment for infrastructure development. This includes establishing independent and professionally managed utilities and providing a regulatory framework for private-sector participation. Experience with private-sector participation in road, rail and ports is mixed. Only South Africa and Kenya have a consistent deal-flow of IPPs, although Nigeria is undertaking promising reforms. Capacity to develop PPPs and the process for approving and regulating projects must be improved in most markets. Too often, key projects remain at the drawing board because they are perceived to be too risky or they lack funds for the development phase. These reforms are needed to increase private sector participation in infrastructure development in Africa but also for the issuance of locally denominated infrastructure bonds. As shown above, the process has begun in a few markets, but across the continent there is still a long way to go. It takes time to build a strong capital market, but the broad rules for doing this are available from other countries. African countries need to learn from them. Cedric Achille Mbeng Mezui is Senior Financial Economist at the Regional Integration Department of the African Development Bank where he focuses on Innovative finance products for infrastructure. 1. Mbeng Mezui, C.A, and B. Hundal, (2013) Structured Finance – Conditions for infrastructure project bonds in African markets. Nepad, Regional Integration and Trade Department, African Development Bank, Tunis, Tunisia.